Please join us at our upcoming work parties. There is a lot happening and a lot to be done. And we will be digging the foundation for our new shed soon! Please bring shovels, rakes and wheel barrows if you have them. Here’s a quick look at what we were able to accomplish last weekend. Today we spread the leaves delivered by Parks onto two of the divisions for the plots, and covered them with some of the 1,200 burlap bags that Carla and Sharon collected last fall. 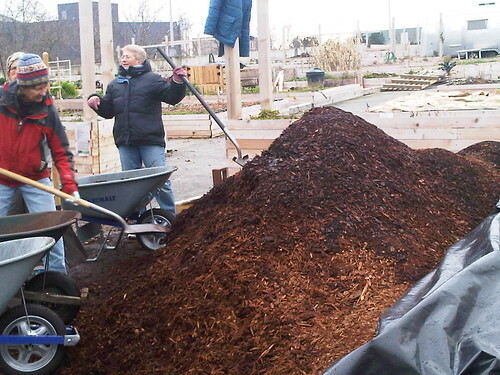 We will be spreading more mulch and burlap bags, plus building retaining walls the week-end of February 2 – 3, 10:00 a.m. – 2:00 p.m.
Update: P-Patch Parties — Continues Today! 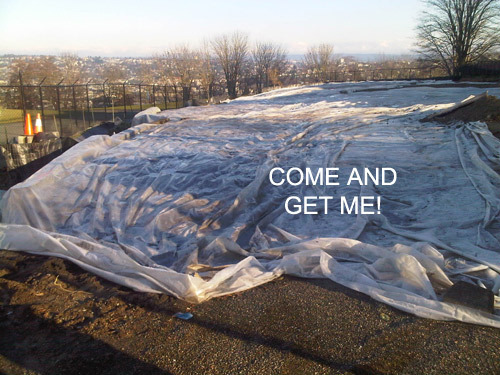 We have a lot going on to get the plots ready for planting this spring and everyone is welcome to come and help! We have the rest of the chips to spread on the berms. Leaves have been dumped off and they need to be spread. And broken concrete is arriving this Tuesday and we need space to hold it while building the retaining walls which is part of the urgency for getting chips and leaves spread. Please join us this week-end and next week-end. 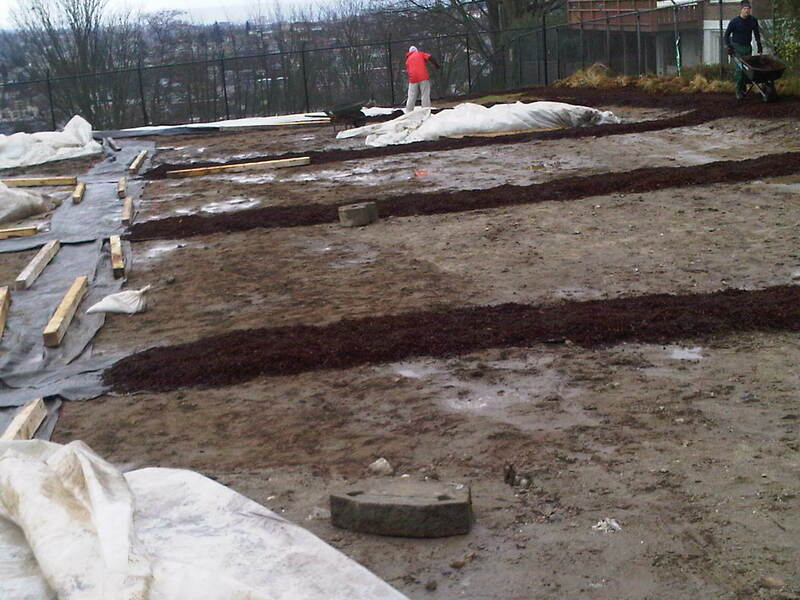 Status as of today, Saturday–the P-Patch is starting to take shape! Moved a lot more cedar chips for pathways today. Sunday we start spread mulch and next week-end building retaining walls out of broken concrete. Thanks to Carla, Phil, Brent, John, Susan, Carol and Sharon for today. We have fun – come join us! 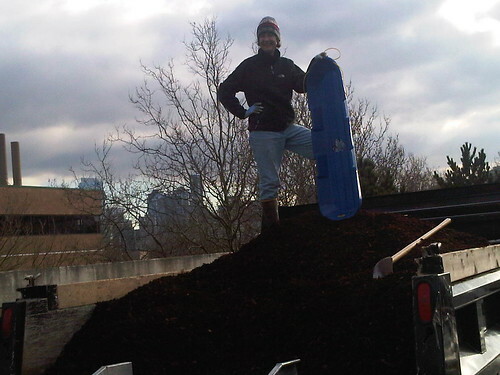 Since yesterday a.m. we have moved about 8 cubic yards of the 30+ cubic yards of cedar chips from the Up-Garden to the P-Patch. The name of the game is to stack the truck as high as possible with cedar chips so all the little corners get filled in and we move as much as possible in one load. Today Kit Hitchcock showed us how to go high-tech with a blue sled. Don’t miss the fun – please join us – we can use your help! The plan is to move 30 cubic yards of wood chips from the Up-Garden on lower Queen Anne and deliver it to the P-Patch by Saturday the 19th. We’re using a 3 cubic yard dump truck and trying to move three truck loads per day. We need more people to load the truck at Up-Garden. Come help us out if you like to work “down and dirty”! Below are photos of MMPP volunteers moving cedar chips from the Up-Garden to MMPP. There are five more piles like this and we can use all the help we can get. Thank you Carla, Joan, Kit, Dean, Ben and Sharon for the 6 cubic yards moved today. Please select “Contacts” above if you want to volunteer – we will be doing this all week! For the next 10 days or so we are going to have real sunshine rather than liquid sunshine at the Magnolia Manor Park P-patch! This is a very good thing because our next work party will be to lay down cardboard and spread cedar wood chips. This is important because it will give us our paths to work on the next phase. As you can see from the photo taken today, MMPP has the best view in the city (that I know of), and you can help to make it even better! Please contact Sharon Knoll via “Contacts” above (or email or call if you already know those details) if you want to volunteer Saturday, January 19. After some delays we are ready to get dirty in our P-Patch! We have 137 names on the wait list for plots. 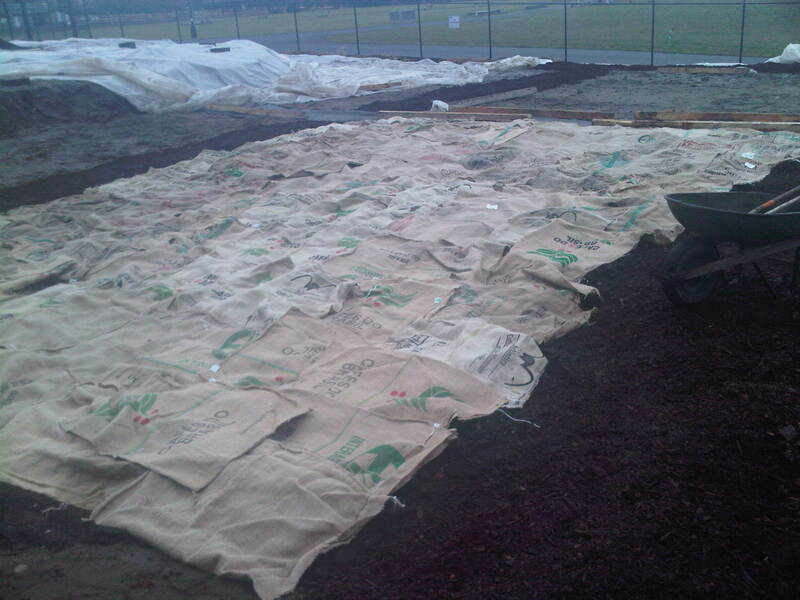 Plots are assigned by number of volunteer hours by the P-Patch Program. And we need you! 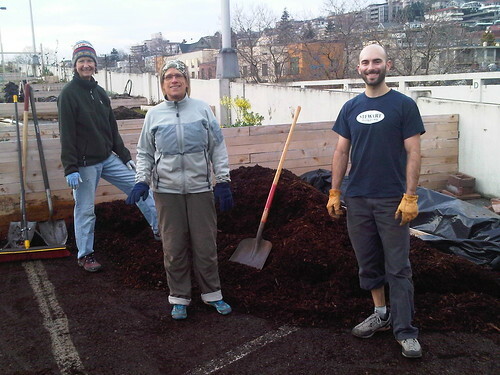 Move 30 cubic yards of wood chips from the Up-Garden on lower Queen Anne and deliver to MMPP. We will be using a 3 cubic yard dump truck. 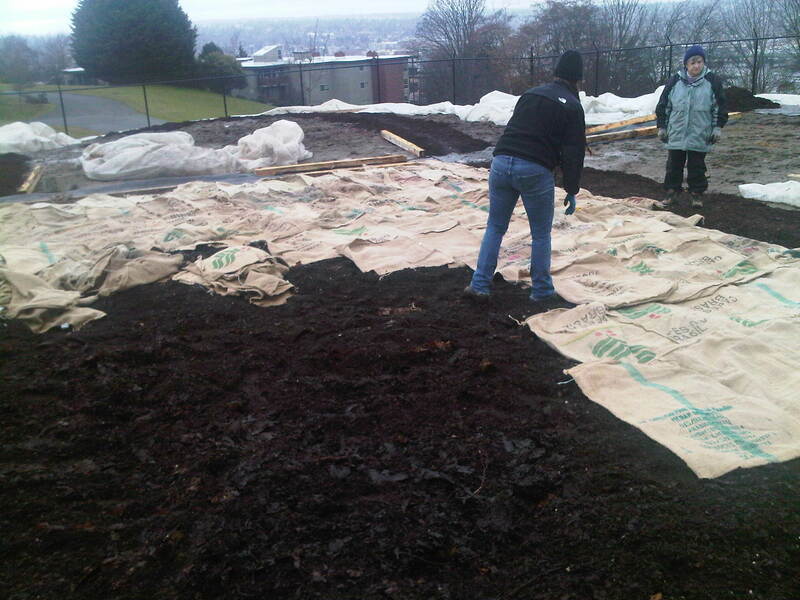 Spread cardboard and chips over the perimeter of MMPP and on the sod berm. Mark Haley is having 8 – 10 cubic yards of broken concrete donated to build retaining walls. If you want to join a work party, please contact Sharon Knoll via our contact us form.